It's me popping in from my other blog www.SharonOjala.com. I just wanted to show you what I made over the weekend. 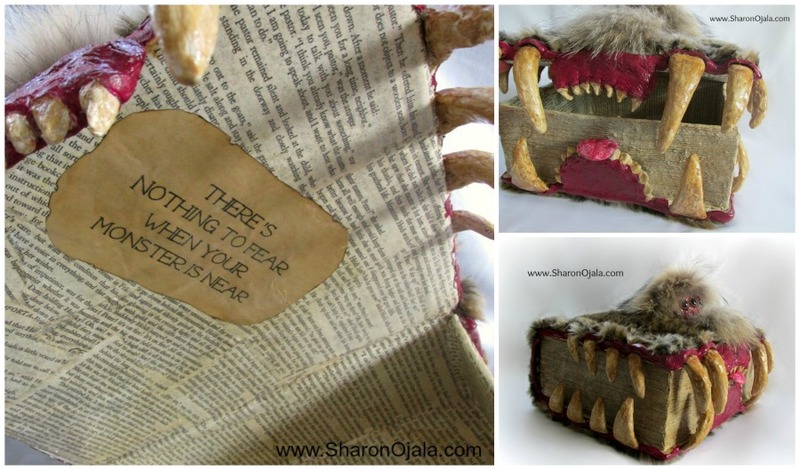 It's a monster made from a shoebox. If you'd like to see more of him.. (I named him Mojo) click here. Lots of people don't realize that I have 2 blogs so every once in a while I like to post a link here on Amigurumi To Go. My other blog is actually my original blog where I used to post amigurumi patterns but a couple years ago I decided to start this blog for amigurumi and leave the other one for non-yarny crafts. Leave a comment if you'd like here or there, I moderate comments to keep the sites spam free so don't worry if your comment doesn't show up right away. Great monster. A lot of kids will like it. I love this Harry Potter monster book!!! How awesome!! I left a comment just now and it doesn't show here.